After conceding Kula Kangri to China, Mt. Jumolhari at 7,326 Mtrs. 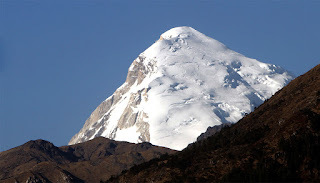 is Bhutan’s second highest peak, after Gangkhar Puensum at 7,570 Mtrs. The photo below was taken on the 26th of November, 2016, from Paro Drugyel Dzong. As you can see, one portion of the peak’s face is almost bare of snow. That is the effect of global warming - snow and ice are melting at an alarming rate from our mountain peaks and glacial lakes in the north. Our reserve of snow and ice that are vital for our sustenance are turned into rain and water, that run off to be emptied into the Indian Ocean. Weather patterns are going haywire - there is rain where there use to be none, and there is none where there use to be plenty. Weather induced seasonal variations are bound to cause crop failures, and Black-necked Cranes will land in Geylephu. Policy failures will cause us to import electricity during the winter months, while proudly claiming to be a net exporter of hydro-generated electricity. Over time our deposit of ice and glaciers will be exhausted and there will be not enough water to turn the turbines of the many hydro-electric projects that we are building blindly. By the year 2030 (14 years from now), India will generate electricity in excess of their need. India will no longer need our hydro-electricity. While in Bhutan our old generators would have outlived their useful life. It will be time to decommission these white elephants - but we will have no money to do so. In fourteen years from now, we would not have repaid the loans on these projects - because the cost has escalated 4 times over their initial projections! Our economic enslavement would be complete! And yet, the politicians still talk of doing Chamkharchhu Hydropower Project. They tell you that it will bring development to Zhemgang. They have seen that Daga Project has happened. They see that Mangdechhu Project is happening. But they are blind to the fact that both these projects have not brought any benefit to Geylephu or Dagana or Tsirang. To what can we attribute this madness?